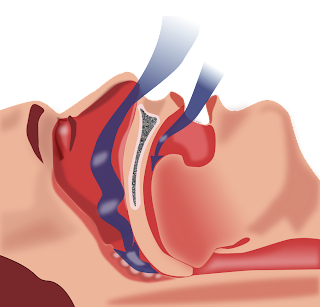 Sleep Apnea is a disorder when breathing is shallow, obstructed or paused while sleeping. The pauses can last from a few seconds to minutes and occurs five to thirty times or even more in one hour. A loud snort or choking sound happens when normal breathing starts again. Sleep apnea disrupts sleep and moves the person out of deep sleep and into light sleep when breathing is hindered. This results in poor sleep quality that makes a person tired throughout the day. Sleep apnea is one of the leading causes of excessive daytime sleepiness. People with severe sleep apnea may have an increased risk of silent strokes and small lesions in the brain, according to a small study presented at the American Stroke Association's International Stroke Conference 2012. A silent stroke is a stroke that does not manifest any obvious and identifiable outward symptoms. Although the person may be unaware of suffering a silent stroke, it still can cause damage to the brain and places the patient at an increased risk of a major stroke in the future. "We found a surprisingly high frequency of sleep apnea in patients with stroke that underlines its clinical relevance as a stroke risk factor," said Jessica Kepplinger, M.D., the study's lead researcher and stroke fellow in the Dresden University Stroke Center's Department of Neurology at the University of Technology in Dresden, Germany. "Sleep apnea is widely unrecognized and still neglected. Patients who had severe sleep apnea were more likely to have silent strokes and the severity of sleep apnea increased the risk of being disabled at hospital discharge." "Demographic characteristics in our study are comparable to western European populations, but our findings may not be entirely generalizable to other populations with diverse ethnicities such as in the U.S.," Kepplinger said.